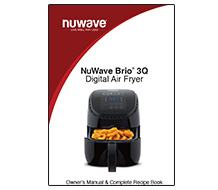 By combining hot air with high-speed air circulation, the NuWave Brio Digital Air Fryer perfectly cooks all of your favorite fried foods quickly and efficiently. 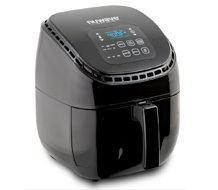 Now you can bake, roast, grill, broil, toast and air fry a wide variety of foods without oil, resulting in food that is just as delicious as ever, but without the grease. 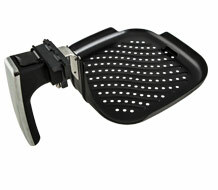 It even includes a unique Pre-Heat function, which helps ensure crispy results. Designed exclusively for the 3-quart NuWave Brio model, the Grill Pan is perfect for grilling steaks, chops, shrimp and everything in between using the NuWave Brio. Enjoy food that’s perfectly seared on the outside, yet tender and juicy on the inside. With no open flame or smoke, you can get that great BBQ taste all year round, ready to enjoy in minutes. The dishwasher- safe Grill Pan is even non-stick so you don’t have to add any extra unhealthy oil when grilling. Designed exclusively for the 6-quart NuWave Brio model, the Grill Pan is perfect for grilling steaks, chops, shrimp and everything in between using the NuWave Brio. Enjoy food that’s perfectly seared on the outside, yet tender and juicy on the inside. With no open flame or smoke, you can get that great BBQ taste all year round, ready to enjoy in minutes. The dishwasher- safe Grill Pan is even non-stick so you don’t have to add any extra unhealthy oil when grilling. 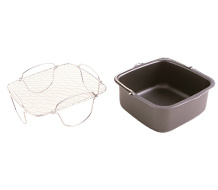 This versatile Cooking Set includes the Reversible Cooking Rack and the NuWave Brio Baking Pan. 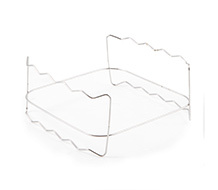 The dishwasher-safe, stainless steel Reversible Cooking Rack can be placed inside the NuWave Brio to help you make the most of the Fry Basket's 3-quart capacity. Designed exclusively for the 3-quart NuWave Brio Digital Air Fryer, the non-stick Baking Pan is perfect for baking everything from macaroni and cheese to small casseroles, eggs and even vegetables in the NuWave Brio. 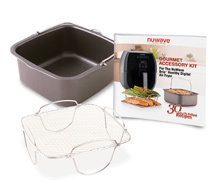 This versatile Cooking Set includes the Reversible Cooking Rack and the NuWave Brio Baking Pan. 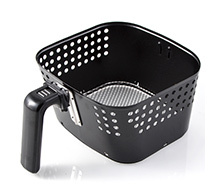 The dishwasher-safe, stainless steel Reversible Cooking Rack can be placed inside the NuWave Brio to help you make the most of the Fry Basket's 6-quart capacity. 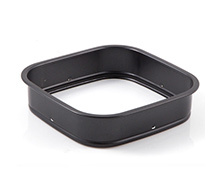 Designed exclusively for the 6-quart NuWave Brio Digital Air Fryer, the non-stick Baking Pan is perfect for baking everything from macaroni and cheese to small casseroles, eggs and even vegetables in the NuWave Brio. This 11-piece bundle of versatile, dishwasher-safe silicone accessories is the perfect complement to your NuWave Brio. The Silicone Cupcake Liners are perfect for baking your favorite cupcakes, brownies, cornbread and even eggs and mini quiches in the NuWave Brio. Foods pop out of these reusable, oven-safe liners without the need for any additional butter or oil. 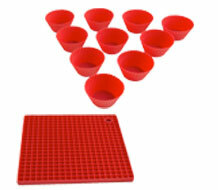 This set includes 10 dishwasher-safe Silicone Cupcake Liners. 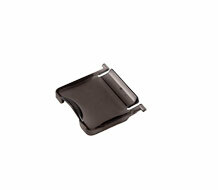 The Silicone Trivet can be used to protect your countertops and tabletops from heat. 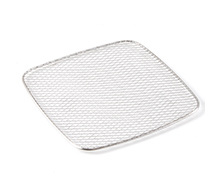 After cooking in the NuWave Brio, simply place the hot basket or base tray on the dishwasher-safe trivet and you’ll never have to worry about damaging your countertops again. Made from durable, dishwasher-safe nylon and featuring silicone handles, these versatile utensils allow you to stir, flip, mix, and much more on virtually any cooking surface, including the NuWave Brio. Plus, thanks to the built-in counter rest, the ends of your utensils won’t come in contact with your countertop, leaving it nice and clean. 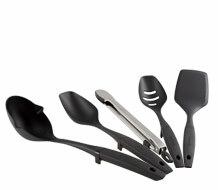 This set includes a spoon, slotted spoon, spatula, ladle and tongs. 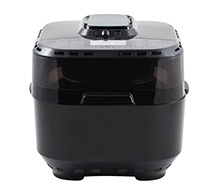 The water-resistant NuWave Brio Carrying Case allows you to take your Air Fryer and accessories virtually anywhere. 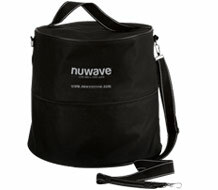 But it is more than just a waterproof case, it is also great for transporting or storing your NuWave Brio in hotels, dorms rooms, family gatherings, your boat, RV, office lunchrooms or anywhere else you travel. 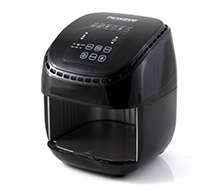 The digital NuWave Brio Power Base contains all the heating elements, touch screen interface and the housing for the Fry Pan Basket for all of your air frying needs. 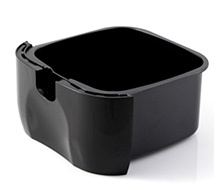 The 3-quart Fry Pan Basket fits securely inside the Base Tray and comfortably holds your food while it cooks inside the NuWave Brio. 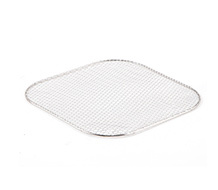 The Fry Pan Basket Net is a wire mesh that fits securely inside the Fry Pan Basket to hold your food while it cooks while also facilitating even heat flow. 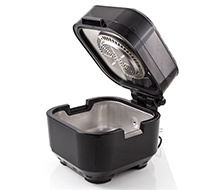 The Base Tray securely houses the Fry Pan Basket inside the Power Base while cooking. 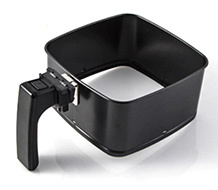 The Safety Cover is a simple device to cover the demounting button on the NuWave Brio basket. 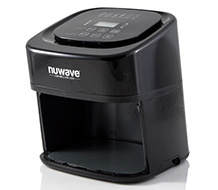 The safety cover keeps you from accidentally pressing the demounting button when removing the basket and base tray from the NuWave Brio. 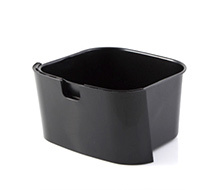 The Fry Pan Basket Divider is designed exclusively for the 6-quart Fry Pan Basket and lets you to evenly divide the basket in half, allowing you to air fry two different foods without any crossover. The Divider comes with 4 Silicone Tabs for quick and easy insertion. 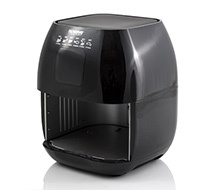 The dishwasher-safe Reversible Wire Rack can be placed inside the NuWave Brio to help you make the most of the Fry Basket's 10-quart capacity. 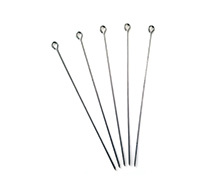 The Skewers are used in conjunction with the Rotisserie Forks to secure your chicken inside the 10-quart NuWave Brio for easy home rotisserie cooking. 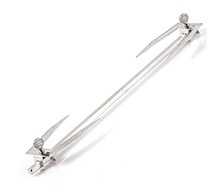 The Rotisserie Fork attaches on the ends of the Skewers, letting you secure your chicken inside the 10-quart NuWave Brio for easy home rotisserie cooking. 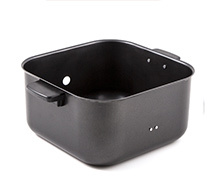 The 6-quart Fry Pan Basket fits securely inside the Base Tray and comfortably holds your food while it cooks inside the NuWave Brio. 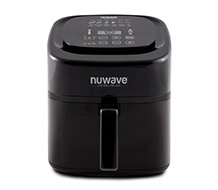 The 10-quart Non-Stick Inner Basket fits securely inside the Base Tray and comfortably holds your food while it cooks inside the NuWave Brio. The 3-quart NuWave Brio Owner's Manual & Cookbook contains all of the information you need to be successful with your NuWave Brio, including dozens of great recipes you can try at home. 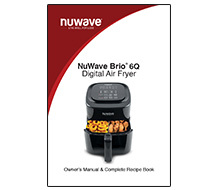 The 6-quart NuWave Brio Owner's Manual & Cookbook contains all of the information you need to be successful with your NuWave Brio, including dozens of great recipes you can try at home. 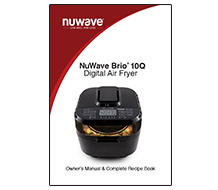 The 10-quart NuWave Brio Owner's Manual & Cookbook contains all of the information you need to be successful with your NuWave Brio, including dozens of great recipes you can try at home. 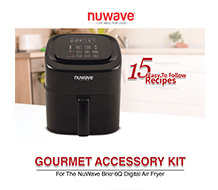 The Gourmet Accessory Kit Recipe Book includes 30 easy-to-follow recipes written exclusively for the 2-piece Cooking Set for the 3-quart NuWave Brio. The Non-Stick Grill Pan Recipe Book includes 15 easy-to-follow recipes written exclusively for the Grill Pan for the NuWave Brio.